While not strictly a writing “thing”, Comic Con in San Diego is a guilty pleasure for me that goes back to my teens when that conference was less than 5000 people. My years growing up with the con have seen it go from a collector’s niche to a media circus where Hollywood showcases some of its biggest works. In retrospect, it’s nothing ground breaking per se, but at the time, Hollywood just hadn’t been up to the task of making something Sci-fi that really gripped the ticket-buying public. Lucus took the tried-and-true hero’s journey, and gave the old-west a futuristic coat of paint and threw in some aliens and it just somehow worked. It was a different take, a fantastic take on science fiction, it forgot fancy tech-speak and made the Kessel Run in less than twelve parsecs. And, yes, in that version, Han shot first! So, here we are in 2015 and SDCC is a few weeks away. Hype is running high because Disney bought the franchise and pried control from Lucas’ bitter angry fingers. Now, with J.J. Abrams at the helm, expectations are crazy high… I don’t think any director could possibly have any more hopes and dreams tied a single piece of their work. To be honest, I think he should hire a few sith lords to protect him in case he’s taken some strange Lost turn off into the dune sea. 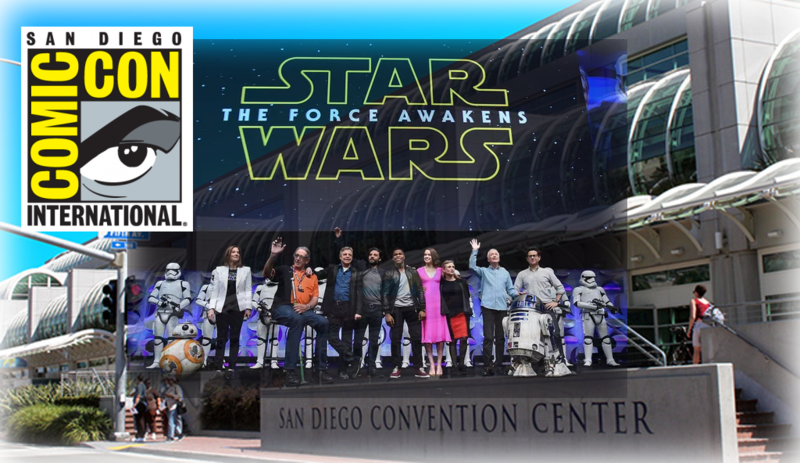 Fans are clamoring for this film, and since the announcement that the cast will be at SDCC, I think some of them are already lining up for Hall H.
This entry was tagged Comics, Movies, Popular culture. Bookmark the permalink.